Work in encaustic should be cared for as you would for any fine art. Work can be stored, wrapped in waxed paper, and bubblewrap (be sure to face the bubbles out so they don’t make imprints in your work) at room temperature and out of any direct sunlight. Download Caring For and Shipping Encaustic. Fusing describes the process of gently melting each layer of paint that is applied, ensuring that it is properly adhered to the layer beneath it. As you apply layers of paint to your support you will want to fuse (or re-heat) each and every layer to ensure that it is adhered to your ground or substrate. It is important to fuse between layers to prevent them from separating. Medium is a mix of pure filtered white beeswax and damar resin. Essentially, it's encaustic paint without pigment. Add it to encaustic paints to increase translucency for glazing, or as an economical sizing for panels. On its own, it can be used for effortless collage work. Watch a video on Glazing and Collage. Opaque colors used straight have total hiding power and bright top tones. Both opaque and transparent colors can be extended with encaustic medium to make them more transparent. 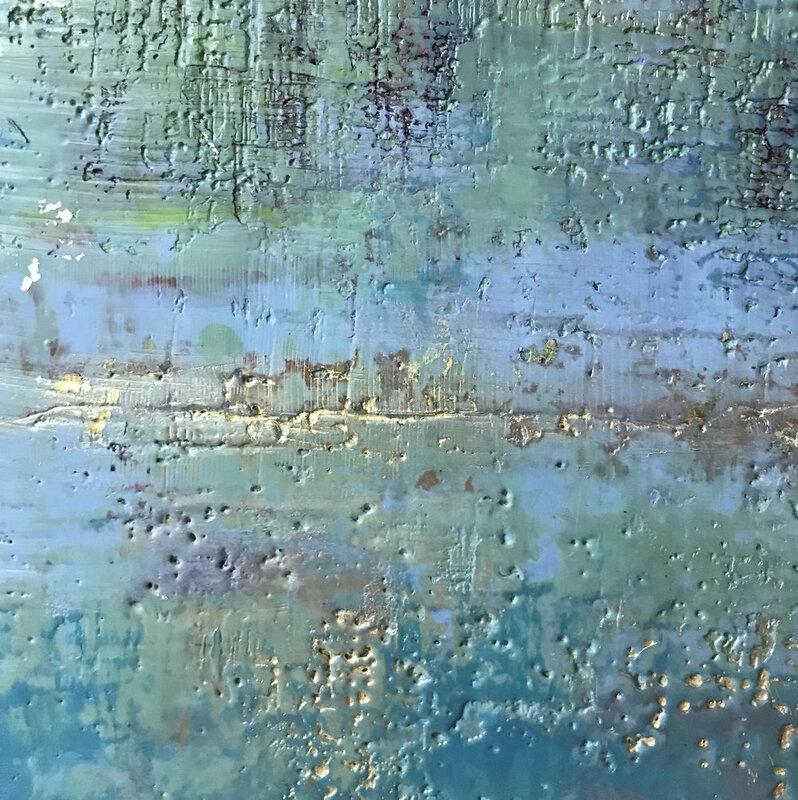 Layers of extended color can be laid one on top of another or separated by layers of straight medium to create unusual translucent effects (with no wait for drying time between layers). 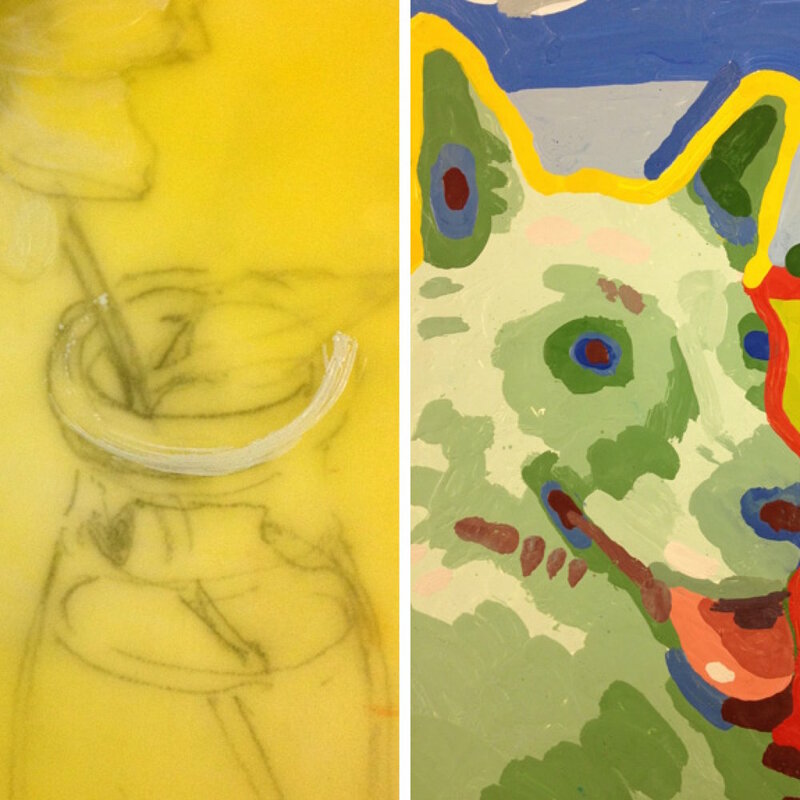 The encaustic can also be made more fluid by adding medium or raising its temperature a little. Black and white and colored photocopies and some computer ink jet and laser prints (all of which can be enlarged or reduced), carbon and graphite paper, graphite, charcoal, pastel, and oil drawings, colored transfer tape/book embossing tape, press type, and images transferred onto waxed paper can all be transferred onto wax. Download a handout on Image Transfers. There are a multitude of tools that can be used to create scraped lines and edges in encaustic. These range from sculpture, ceramic and dental tools to found objects and string. Masking tape can be used to mask surfaces that can be painted into, then pulled back to create a line. 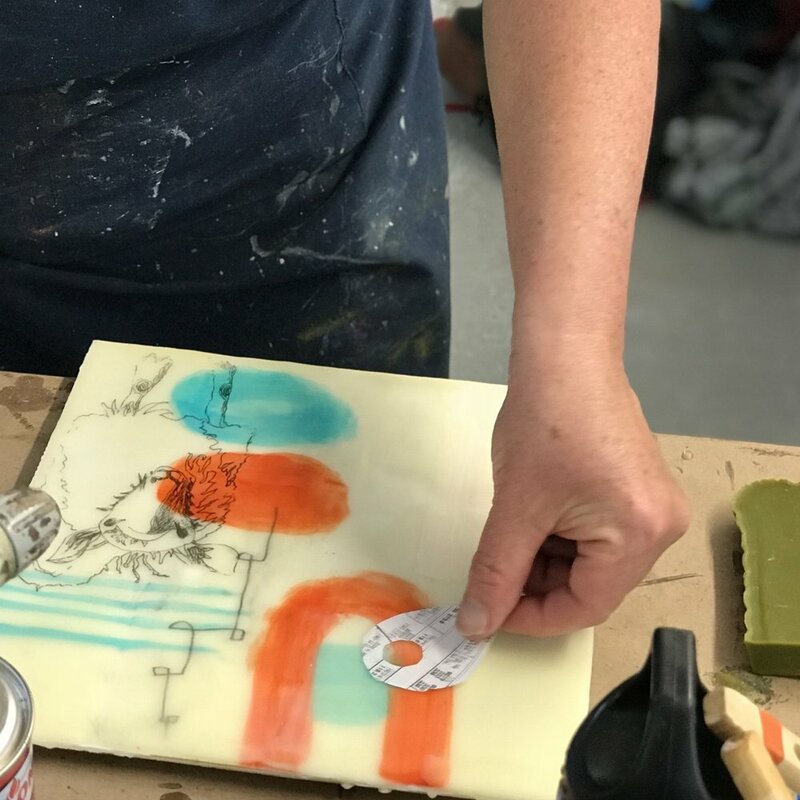 Pre-manufactured stencils or handmade stencils can be applied to the wax and painted into to form shapes, designs, or patterns on the surface of the encaustic. Shapes can also be carved out and filled in with another paint color, creating an inlay effect. For a smooth surface, use a hake brush and a palette cup of paint or medium. Apply the wax in sections, moving across a small area of your panel in one swipe to avoid the build up of texture that will occur as the wax cools across the surface. Working with cooler wax or using multiple applications with a brush (especially a dry brush) will build up texture. You will still need to fuse textural surfaces for them to remain stable and exaggerated textures will be fragile.